See posters from the Exhibit HERE. Magie Dominic (with John Borske and Donald Kvares). Part of a Cino costume display. “Dames at Sea” costumes in foreground. Hanna’s Skirt Won’t Stay Down’) and Bob Heide. Here, one honoring Doric Wilson. Wally Andochuk in this PHOTO. A central arch bears Joe Cino’s favorite saying. Paul Foster’s exhibit certainly catches the eye. Shirley Stoler, Joe Davies’ nose. Bob Dahdah with one of Off-Off’s staunchest supporters and patrons, Doctor Paul Cranefield. Playwright Tom LaBar and actor Bill Mahoney parenthesize a young student of theatre history. The only photo of me with the love of my life, actor Joe Pichette….and I’m in drag. 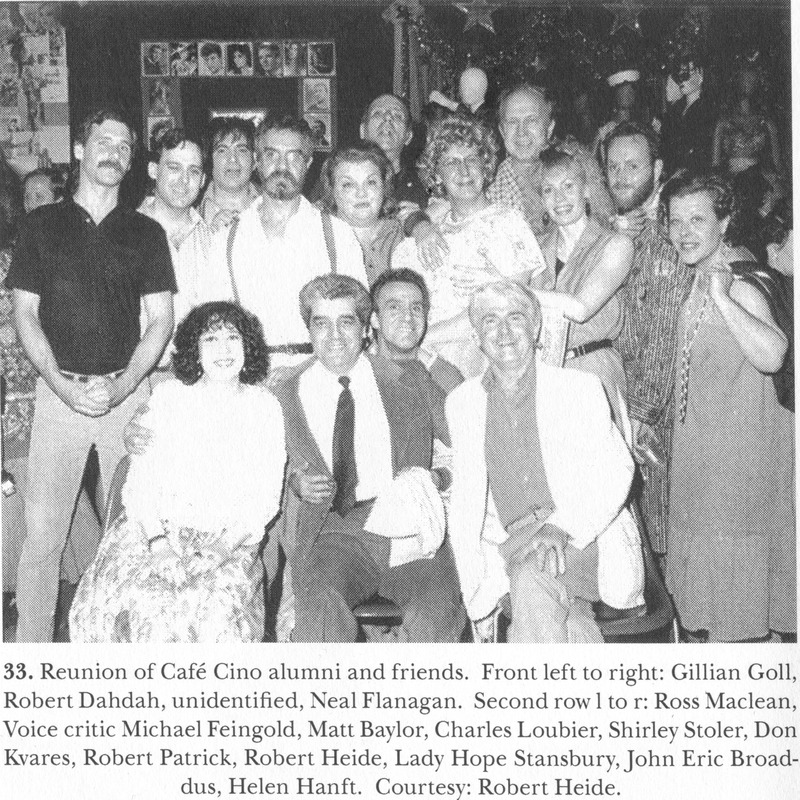 Ellen Stewart, a whole lot of Harrises, Shirley Stoler downfront, and Jean-Claude Van Itallie amongst them. Neil Flanagan emcees, of course. Unidentified, painter Patrick Angus, playwright Ross MacLean, MAGIE DOMINIC, H.M. KOUTOUKAS. Kenny Burgess’ flyer for the appearances of Cino people at the exhibit. Kenny did it in the style of his Cino posters, made to look like abstract art so the police wouldn’t realize we were doing shows. One of Kenny Burgess’ Cino doors. 1965-ish–a son of MILTON WYATT, who owned a bookstore next to the Cino, runs past one of Kenny’s doors.